Our 100% online DOT HAZMAT Training: Function Specific – Labeling course helps employees involved with HAZMAT transportation and the use of HAZMAT labels to meet the training requirements for 49 CFR 172.704(a)(2)(i). Students will learn how to identify hazardous materials through the HAZMAT labels, how to select the proper hazardous material labels, and how to complete HAZMAT labels as needed. Volume Pricing option available. Our DOT HAZMAT Training Online: Function Specific – Labeling course is designed for employees involved with hazardous materials transportation, such as shipment, carrying, or manufacture, and also involved in the use of hazardous materials labels. This course will help the student learn how to use labels to identify hazardous materials, select labels based on the hazardous material, and complete hazardous material labels as needed. This training meets the requirements for 49 CFR 172.704(a)(2)(i). If you took our DOT HAZMAT Training: Basic General Awareness (4 Hours) course, this function-specific labeling class will provide expanded labeling training. If you took our DOT HAZMAT Training: General Awareness/Function Specific (10 Hours) course, the contents of this labeling class were included. Designed by Certified Outreach Trainers, this DOT HAZMAT Labels / Labeling course includes up-to-date, high quality training created with your safety and learning as our top priority. The course features interactive training through our state-of-the-art Online Training System (OTS), which combines audio and visual elements for maximum retention. The course is completed entirely online using a computer with an internet connection and is available 24/7. A downloadable student manual is provided for reference during and after the course. For your convenience, the course can be completed over time, and your progress will be saved to the last section completed. Students are given 6 months to complete the course after enrollment. We are so certain you will be satisfied with your experience, that we offer a 100% Money Back Guarantee*. When are labels required? | Determining labels | Labeling table | Primary and subsidiary labels | Subsidiary hazard labels table | Display of hazard class or division. Cargo aircraft only | Class 1 explosives | Non-flammable and non-poisonous gases | Poisonous gases by inhalation | Mixed and consolidated packaging | Authorized label modifications. 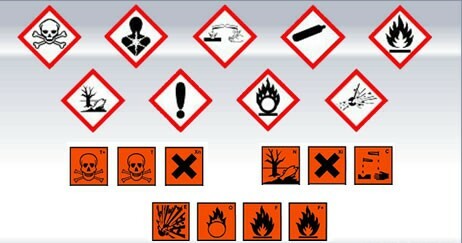 Class 1: Explosive labels | Class 2: Compressed gas labels | Class 3: Flammable liquid labels | Class 4: Flammable solid labels | Class 5: Organic peroxide and oxidizer labels | Class 6: Toxic materials labels | Class 7: Radioactive materials labels | Class 8: Corrosive materials labels | Class 9 labels | Empty label. Durability | Design | Size | Form identification | Exceptions. Placement | Multiple labels | Contrast with background | Duplicate labeling | Visibility. Exceptions and forbidden labeling | Dewar flasks and cylinders | DoD shipments | Low specific activity | Subsidiary labeling | Poisonous by inhalation | Prohibited labeling and exceptions. General requirements | Radioactive labels | Selecting labels | Label locations | Label entries | Empty and fissile labels | Overpacks and freight containers. The objective of this DOT HAZMAT Labeling course is to meet the Federal Department of Transportation (DOT) training requirements for 49 CFR 172.704(a)(2)(i). This HAZMAT DOT Labels / Labeling course consists of 7 sections, which are fully narrated and interactive. Knowledge checks and exercises within each section of our Online Training System (OTS) help the student retain the knowledge needed for the final exam. This DOT HAZMAT Labeling course was designed by Certified Outreach Trainers and meets the requirements for 49 CFR 172.704(a)(2)(i). Please note that this DOT HAZMAT Labeling course is not meant to replace company-specific or function-specific training provided by your employer on equipment use and procedures for your particular work environment. You must be trained by your employer on the hazards, equipment, engineering and administrative controls, safe work practices and emergency plans specific to your role and workplace. Employers need to evaluate employee needs for additional DOT hazardous material training and training in the use of personal protective equipment used on the job.